Salvatore Ferragamo CD And Headphone Silk Tie | OhGizmo! If you’re forced to wear a tie to work every day, allow me to offer my condolences. As a writer working from home I don’t even need to wear pants, let alone a button-up shirt and tie in some sort of coordinated color scheme. 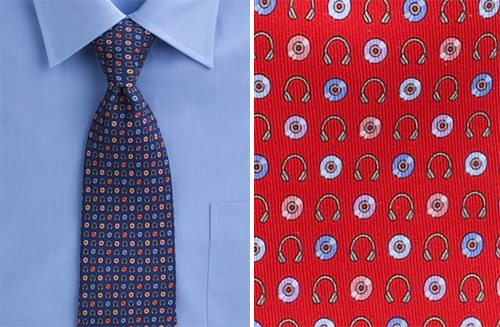 But if you feel like fighting back against the corporate world, or at least want to stand out just a little bit, this CD and Headphone pattern silk tie from Savatore Ferragamo will show your co-workers that underneath all those fancy clothes you’re still a geek. The pattern is actually pretty subtle, so someone would have to be really paying attention to notice it, and the tie itself is made from fine Italian silk. It’s available from Saks Fifth Avenue in navy or red for $160.